...and should land in your postboxes by mid-January. The Debate on Egyptian dynasties continues. Did horses actually charge into infantry? More on War Wagons. Impressions of Slingshot 321. 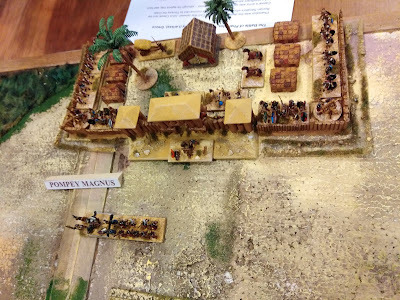 Practical considerations for setting up the Telamon battle at Battle Day. Duncan Head analyses the background, campaign and battle of Telamon and concludes that the Gallic generals were more savvy than they are usually given credit for. 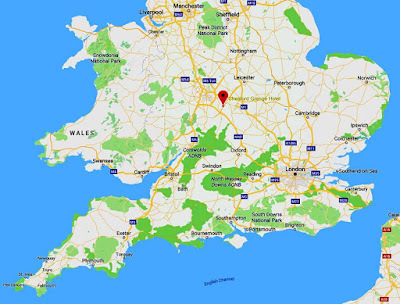 DBA is alive and well in the UK with league competitions held across England and Wales. 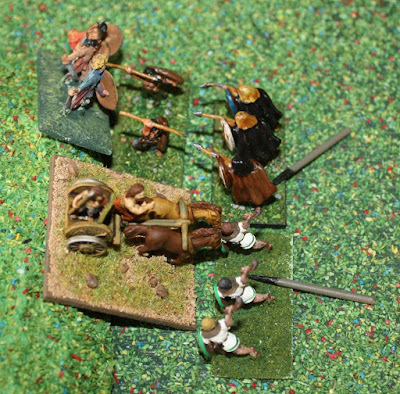 54mm Carthaginian figures that are fun to paint and look spectacular on the gaming table. The Society's rules for Ancient naval combat, Corvus, is given an tryout with positive results. 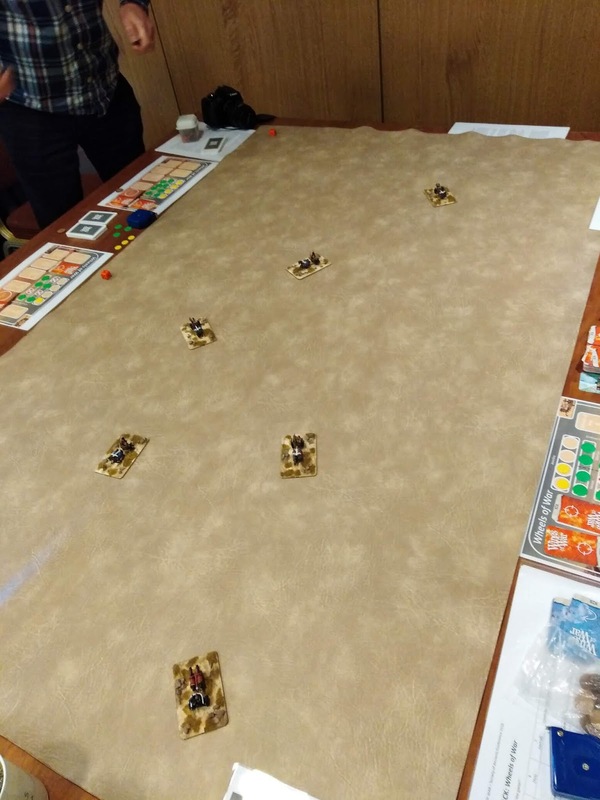 Chris Hahn games Telamon using Armati and gets a game that is fun and historical. Going through the meagre evidence, Nicholas Spratt puts together a picture of the Cham army that shows it was different from its traditional enemy, the Khmer. Irregular Miniatures 2mm Ancients range. 15mm Vikings and Saxons by Legio Heroica. Augustus at War: the Struggle for the Pax Romana. The Black Prince and the Capture of a King. 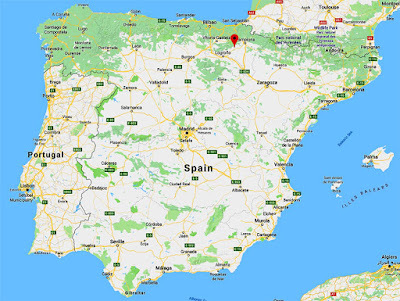 ...where Madaxeman gives some lively and informative AARs on the Spanish games at Estella, with all sorts of goodies like historical battle videos to flesh out the battle reports. A list of ADLG events past and future here. 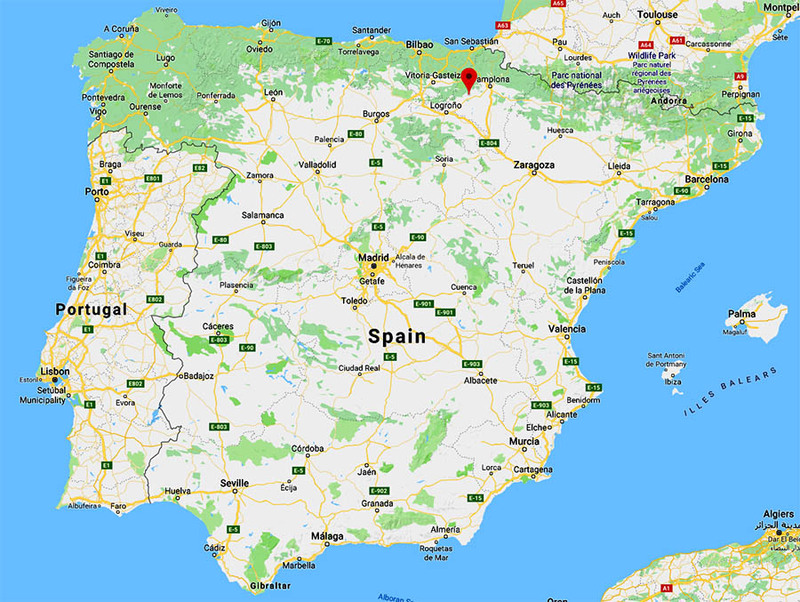 A map with clubs that play ADLG here. I’m not long back from the Society Conference, the third of the “revived” series, which was held in the Chesford Grange hotel in Kenilworth. It was a really enjoyable weekend, possibly the best yet. The Conference proper is held on Saturday and Sunday, but quite a few of us arrived on Friday night and spent some time in the bar and the restaurant renewing acquaintances, meeting new people and generally chatting. Attendees were in the high twenties, though a few were only doing one day. Phil and Sue Barker honour us with a visit. Saturday, after a brief welcome from organizer Richard Lockwood, started with our first plenary session, Mark Fry talking about Bronze Age chariots. 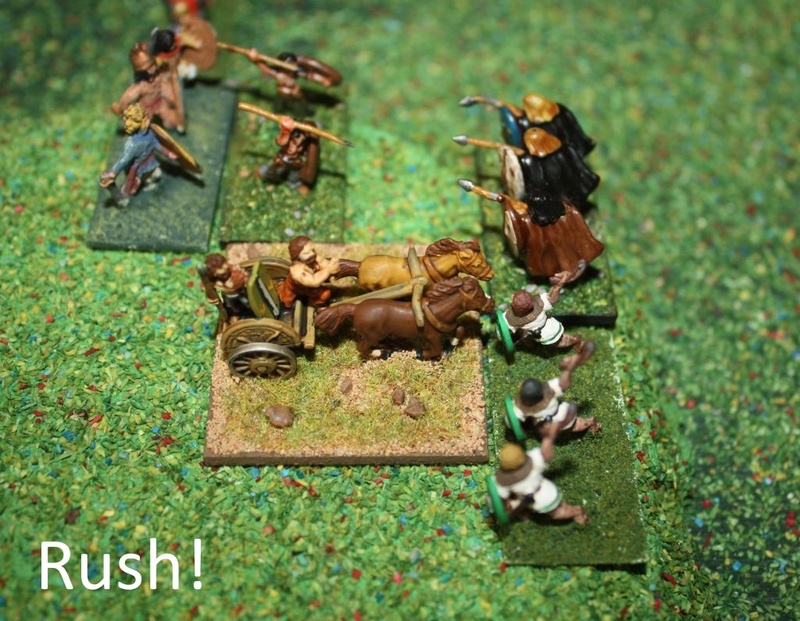 Mark’s not happy with how chariots are handled in most wargames rules, and is working on a new way of portraying chariot warfare. After his talk we broke up into several gaming sessions, and I took part in a game with Mark’s new work-in-progress chariot rules. Wheels of War is based on the popular Wings of War WWI air combat game, and gives players one chariot each to represent the individual manoeuvre of chariot warfare. Six of us played, three chariots a side, wheeling, manoeuvring, shooting arrows and javelins and in one case colliding rather messily. The Blue team, which is to say mine, emerged triumphant (thanks more to luck than judgement, I feel – though misjudgement on the other team may have played a part!). Still in development, but potentially a very good and different game. Mark Fry rolls across the desert. 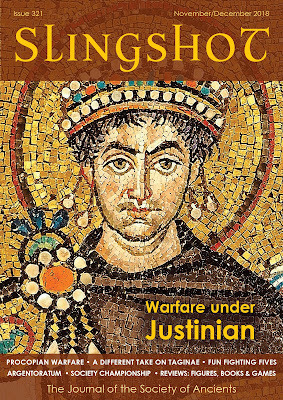 On Saturday afternoon we heard Matt Bennett and Roy Boss talk about the Normans in Italy and Komnenan Byzantine warfare. Two short half-hour presentations in the plenary slot is a new idea, and I’d have been happy to listen to a full hour from each of them. For the Saturday afternoon games, I joined Matt for one of the three Komnenan-era Armati games he and Roy were putting on, in our case playing on the Byzantine side in a refight of Dyrrhachium. A narrow victory for the East Romans – we got off to a good start, looked to be getting in serious trouble, but were finally victorious thanks largely to my partner managing to sandwich one lot of Norman milites between two Byzantine cavalry units. I’m still not hugely keen on Armati, but it runs smoothly when you have someone on the table who knows the rules. Then off to the Conference dinner, where we spent just a little too long waiting for the overstretched hotel staff to serve up the food. 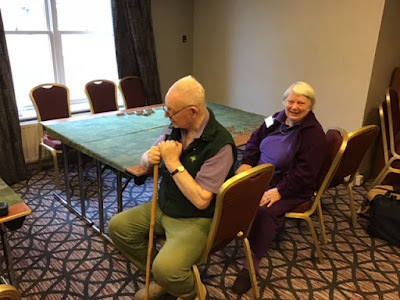 When the post-dinner games turned up – Northampton in 1460, Call it Qids (for those who hadn’t had enough chariots yet) and Gladiolus – I put in one game of Gladiolus, and was luckily spared by the crowd after being speared by Richard Lockwood. A reasonably early bed-time since I was on show the next morning. I must be getting old. Sunday morning started with me talking about Telamon with the 2019 Battleday in mind, and then more games. 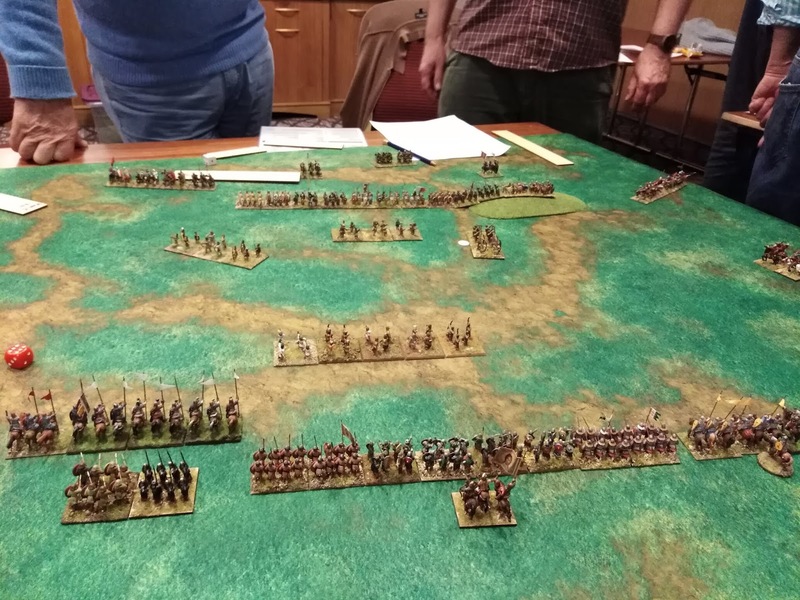 I joined in a six-player workshop session run by Richard Lockwood to develop a new classical warfare system using mechanisms from Dux Bellorum and other rulesets. 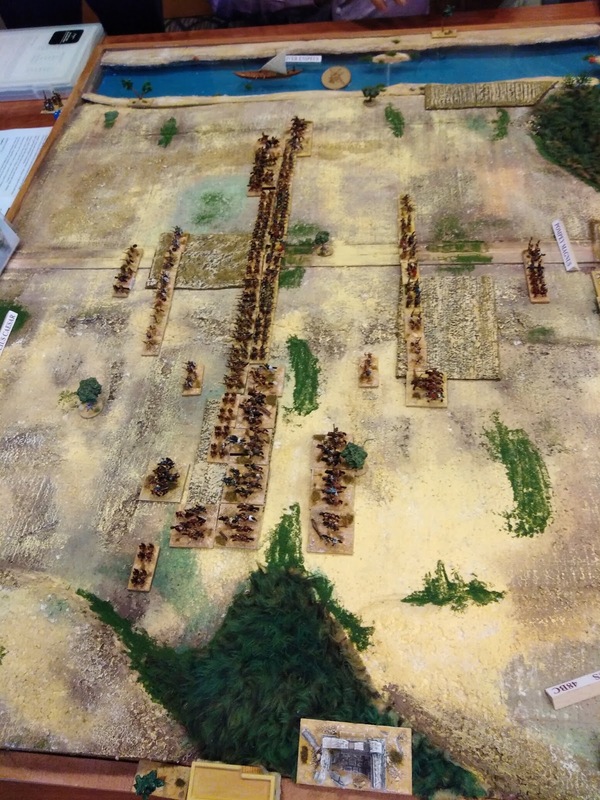 We played Macedonians against Persians, and I took one Macedonian cavalry wing. 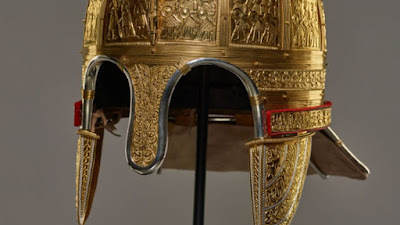 Cavalry units are fragile, and I certainly charged in sooner and more rashly than Alexander would have done, eschewing his careful preparations because I couldn’t think of what else to do. After a few moves cavalry and skirmisher units on both sides were evaporating like raindrops, including one of my two units of Companions. The heroes were the Thracian light cavalry on my extreme right, who destroyed the Persians’ Scythian horse-archers, worryingly refused to move immediately after that (units dice against their Courage to see if they move; the Thracians obviously needed to breathe their horses) but then charged into the flank of a low-morale Persian colonist cavalry unit, destroyed it, saw the next Persian unit along (weakened by destroying the Companions) break on a morale test for seeing routers, and then charged down to hit a fourth Persian unit, in melee with the surviving Companions, and help destroy that one as well. At the end the Macedonians had won both cavalry wings with one or two units standing on each wing, while the phalanx was locked in combat with Persia’s Greek hoplites just waiting for us to ride in and save the day. Richard Lockwood in a commanding pose. Final session in the afternoon, and I played in Phil Steele’s DBA-plus game of Pharsalus, with lovely 10mm armies on purpose-built terrain. Phil was trying to simulate the multi-line nature of Roman battles by fielding two DBA armies (not necessarily 12 elements each, but close) as the advance and reserve lines respectively. 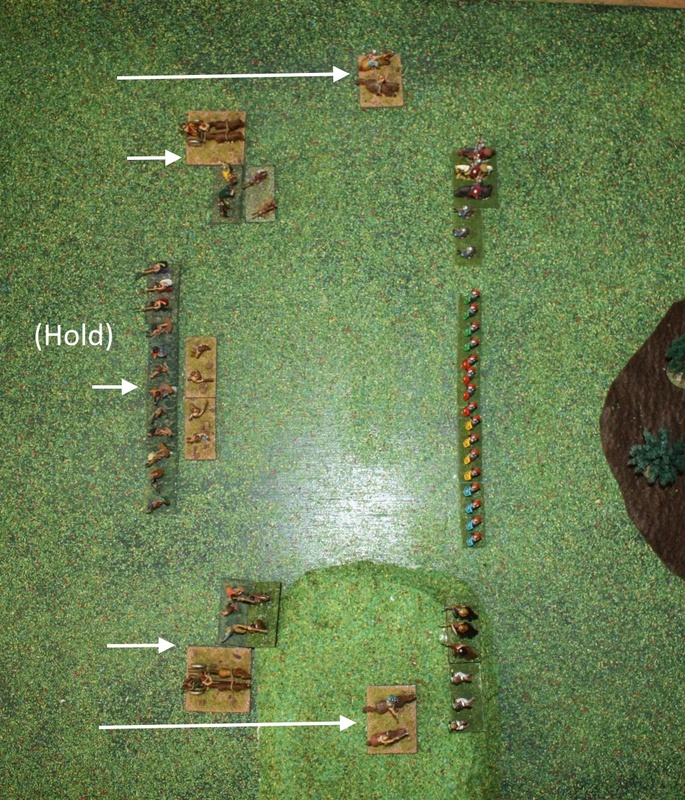 The two advance lines fight, supported as players think fit by the reserves, until one reaches demoralisation point. Then both advance lines are removed except that the winner may leave one or more elements in place, depending on the margin of their victory, and lines are redressed for the main event. Our advance-line clash took longer to resolve than Phil expected but eventually the Pompeians (I commanded the Pompeian advance line) won, though only by a margin of one element. 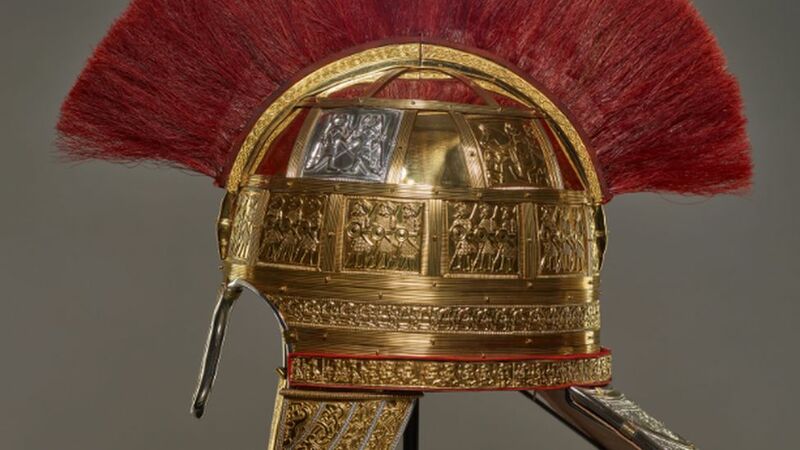 Interestingly we had also destroyed several elements of Caesar’s reserve line – including two of Caesar’s three veteran legionary elements, and discovering the mechanism Phil was using to reflect their toughness was a bit of a shock! At that point I left to make an early start for home, but I gather that in the second phase of the game Pompey managed to reverse history and defeat Caesar’s weakened main line. All in all an excellent weekend. I’m certainly up for next year’s. This was our best Conference so far, with informative and entertaining presentations and some really good games. The talks ranged from the Biblical period to mediaeval so there was a good range of topics. My wife used to teach infants and was always delighted when the boys in the class were ‘engaged’, that is engrossed in a group activity. Well the members who attended the Conference were definitely absorbed in the action. Notably there was loud involvement in several of the games which is always a good sign. I was very pleased for Richard who puts in an enormous investment of hard work across the weekend to make sure the event goes smoothly. He can be very satisfied with the result. We could happily take about 50 people as a maximum so the good news is that there is room for more of us to enjoy the 2019 event. One thing we would happily include is shorter presentations, so if you have enough material to speak for say fifteen minutes on wargaming or an historical topic then we will happily give help with visual aids and even where to get information. 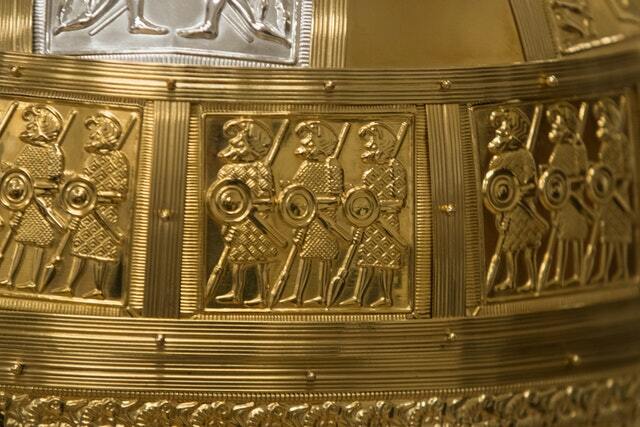 In 2009 the largest hoard of Anglo-Saxon gold and silver metalwork ever found was discovered near Litchfield, in Staffordshire, England. The 5,1KG collection of over 3500 items included a fragmented helmet which experts studied and then reconstructed over 18 months using cutting-edge technology and ancient craft techniques. 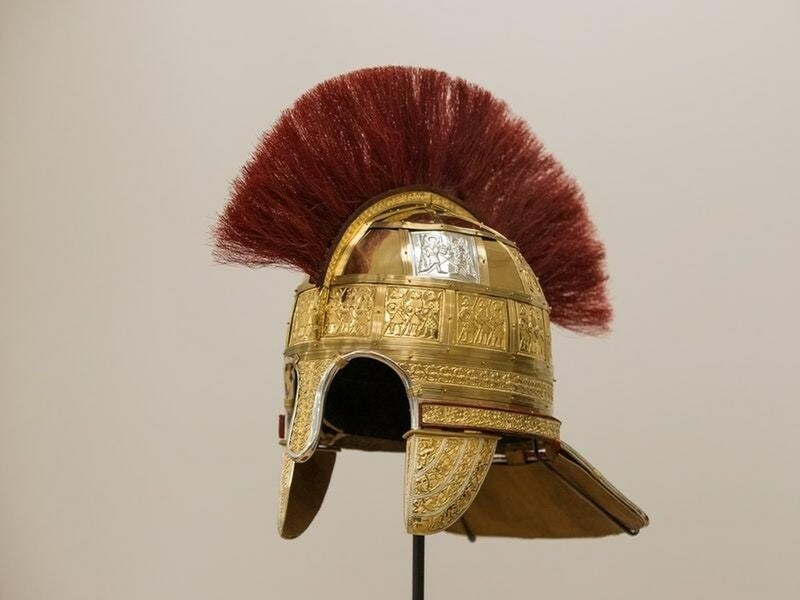 Two replicas of the helmet have been completed and will go on display at the Birmingham Museum and Art Gallery and the Potteries Museum and Art Gallery in Stoke-on-Trent. The debate continues on Egyptian chronology whilst readers examine How Hard does a Horse Hit and Wargaming War Wagons from Issue 320. 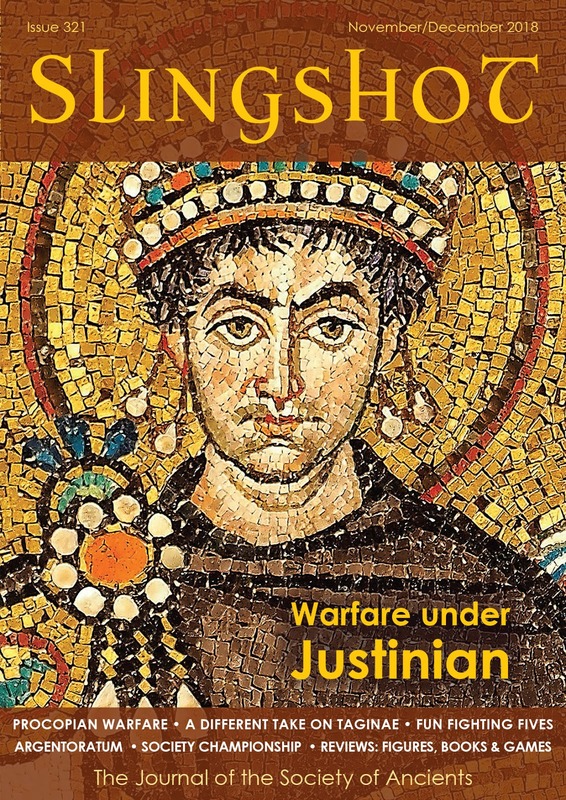 Roy Boss examines the armies and fighting styles of the era of Justinian to see if there is a commonality. Chris Hahn wargames the small but important pre-battle skirmish in which a body of Gothic cavalry attempted to force a passage through Roman infantry to the Roman rear. 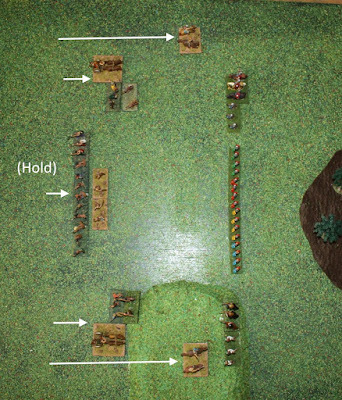 The article is accompanied by diagrams giving an overview of the main battle itself. David Knight plays Roman-Pictish skirmishes at Big Roman Day at Falkirk against 5-year-olds - and gets trounced by one of them! 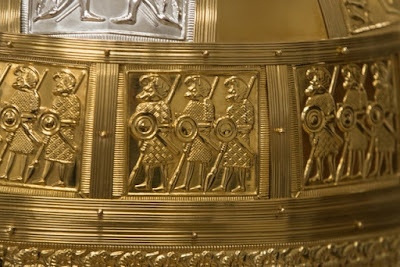 Patrick Waterson examines the battle between Julian and Chnodomar of the Alamans to see how well-merited Julian's reputation for generalship really was. Denis Grey describes how the Society's annual Championship works. 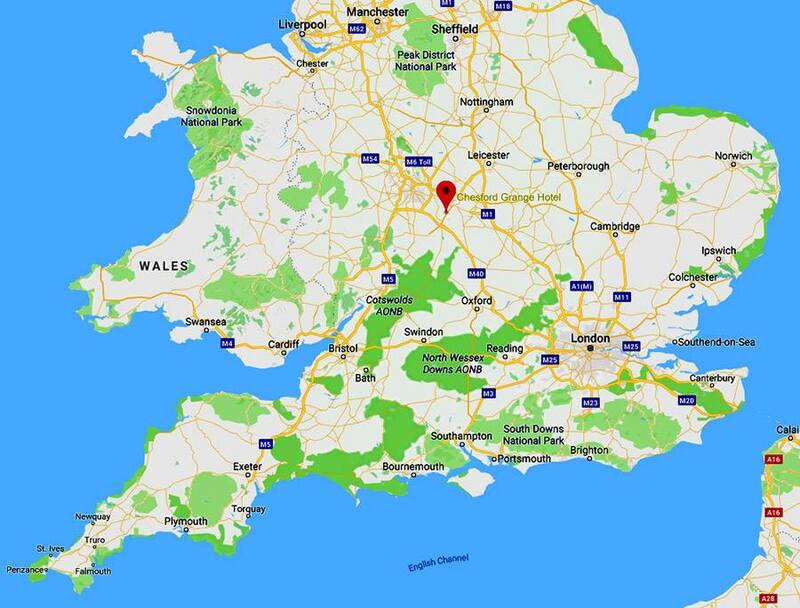 A reminder that the Society of Ancients Conference 2018 will take place over the weekend 24th and 25th November, at the same venue as the 2016 and 2017 Conferences, the Chesford Grange Hotel, Kenilworth, Warwickshire. The aim is to get together as a Society and to exchange ideas on wargaming in the ancients and medieval periods. And to enjoy playing some good and varied wargames! 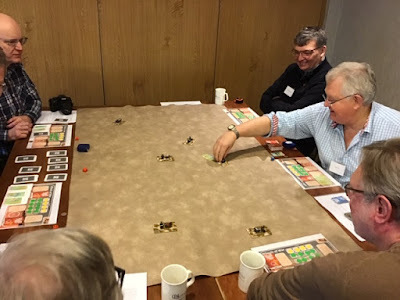 The weekend will contain a mixture of presentations and wargaming sessions in small and larger groups. Already confirmed as a speaker for 2018 is Duncan Head, author of the legendary Armies of the Macedonian and Punic Wars and many other books. The cost for the weekend is £189, which includes the two full days at the Conference, buffet lunch both days, the Conference Dinner on the Saturday evening, bed and breakfast Saturday night, and teas and coffees, fresh fruit, biscuits and cakes etc throughout the days. Single day attendance (without the B&B and Saturday Dinner), including the lunch, is available for around £45 per day (also held at last year's cost). For those arriving on the Friday evening we have negotiated a Conference bed and breakfast rate, which should also be booked in advance though us. This also remains held at last year's cost, at £105. Because the Society is required to pay the venue in advance for the Conference we will require full payment four weeks before the Conference. However, in order to reserve your place we will initially be taking deposits, either by the Society website PayPal route or by cheques made out to the Society of Ancients and sent to the Treasurer. These deposits are non-returnable unless we are able to find someone else to attend in your place. The deposit cost is £45 (as it was last year). A new Ancients system with the rulebook and army lists currently available for free (who can resist that? ), which promises a fast game that is easy to get into - only the first 12 pages of the 24-page rulebook are necessary for play.